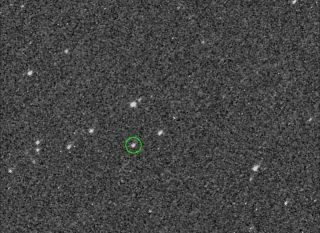 On Aug. 17, 2018, NASA’s OSIRIS-REx spacecraft obtained the first images of its target asteroid, Bennu, from a distance of 1.4 million miles (2.2 million km), or almost six times the distance between the Earth and moon. After a nearly two-year space chase, NASA's OSIRIS-REx probe finally has its asteroid target in sight. OSIRIS-REx, which launched in September 2016, has captured its first imagery of the 1,650-foot-wide (500 meters) space rock Bennu, NASA officials announced today (Aug. 24). "I can't explain enough how much it meant for the team," OSIRIS-REx principal investigator Dante Lauretta, of the University of Arizona, told reporters today. "I know Bennu is only a point of light here, but many of us have been working for years and years and years to get this first image down, and it really represents the beginning of the great scientific expedition that is OSIRIS-REx." Bennu will loom larger and larger in OSIRIS-REx's crosshairs over the next few months. If everything goes according to plan, the probe will arrive at the space rock on Dec. 3. It will perform a series of close flybys, taking measurements that will establish the asteroid's mass, and then begin circling Bennu on Dec. 31. That will be no mean feat. "It's Bennu's size and small mass that make the navigation challenges on this mission unprecedented, really," said Michael Moreau, OSIRIS-REx flight dynamics system manager at NASA's Goddard Space Flight Center in Greenbelt, Maryland. "On December 31, when we insert into orbit, then it will become the smallest planetary object to ever be orbited by a spacecraft." OSIRIS-REx will study Bennu from orbit for a while, and then spiral down to snag a sizable sample from the rock's surface in the middle of 2020. The spacecraft will depart Bennu in March 2021, and the sample, encased in a special return capsule, will parachute down to Earth in September 2023. Bennu is a carbon-rich asteroid, the type that many scientists think delivered the chemical building blocks of life, along with lots of water, to our planet via impacts long ago. So, analyses of the returned sample in labs around the world could reveal key insights about the early solar system and the origin of life on Earth, mission team members have said. For example, Bennu is a potentially hazardous asteroid; there's a very slight chance the rock could slam into Earth in the late 22nd century. OSIRIS-REx's observations should help scientists better understand the forces that shape asteroids' paths through space, and therefore better predict where, exactly, dangerous rocks are going, Lauretta said. And then there's the "resource" aspect. Bennu likely contains lots of water, which space mining companies such as Planetary Resources are extremely interested in. The idea is to split asteroid water into its constituent hydrogen and oxygen — the chief components of rocket fuel — and then use this stuff to set up propellant depots off Earth. Voyaging spaceships could then top off their tanks at such gas stations, making space exploration cheaper and more efficient. OSIRIS-REx's work will reveal how resource-rich Bennu really is. And the probe's precision maneuvers around the rock will demonstrate vital navigation skills, said Lauretta, who serves on Planetary Resources' scientific advisory board. "Any asteroid mining endeavor is going to have to understand how to do that," he said. OSIRIS-REx isn't the only asteroid-sampling mission currently underway. Hayabusa2 will grab samples of Ryugu relatively soon, perhaps as early as October; this material is scheduled to come down to Earth in late 2020. The OSIRIS-REx and Hayabusa2 teams have been working together and will continue to do so, Lauretta said. "All of the information about the Hayabusa2 spacecraft's interaction with the asteroid surface will also be important for OSIRIS-REx as we time the final touch-and-go [sampling] maneuvers for our mission," he said.